When I installed a new 21.5" iMac, Davis Instruments WeatherLInk for Mac OS no longer ran. I had been using the standard data logger to periodically upload the Vantage Pro 2 to my old iMac. 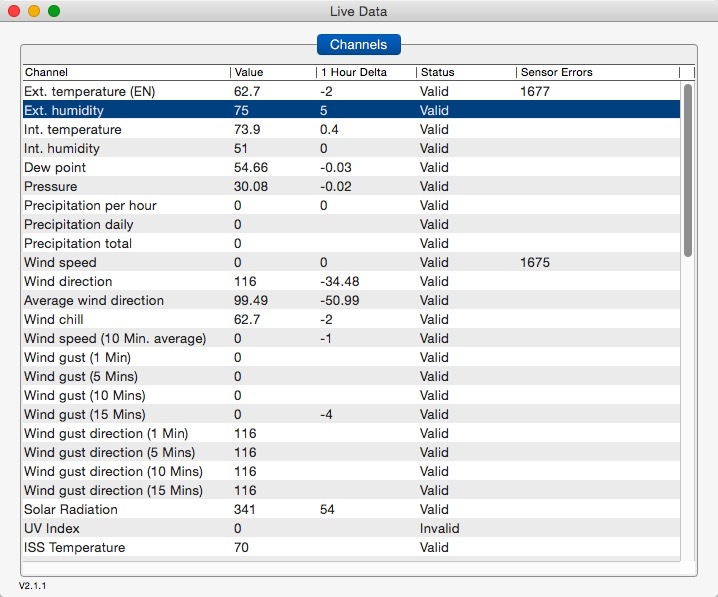 So I invested in a WeatherLinkIP data logger and connected the output with an ethernet cable to an Apple Airport Express on my local network. After installing WeatherCat 3.0.4 I was pleased to see it running flawlessly. I am not uploading to a web page but using it to monitor my local weather and remote agricultural sensors. The data logger interval is set to 1 minute, so the curves are smooth. There has been, however, an interesting anomaly in the temperature graphs. I'm graphing both interior and exterior temperature at the console as well as a remote temperature sensor in my greenhouse. After being in operation for 42 days, all three temperature graphs showed four square pulses superimposed on the curve. There were three pulses each lasting 2 hr and one pulse lasting a little over 1 hr, each pulse following the other with a 30 minute interval. It looked like a square wave was superimposed on the graphs. The amplitude of the pulse varied with the channel. After the last pulse, the graph reverts to normal. This episode has occurred three times since installation January 1, 2019. The pulse does not coincide with the temperature reported in the WeatherCat Controller. So this anomaly is a signal superimposed on the data channel at the graph. Does anyone have ideas how this happens? Wild guess, you have a neighbour with a station on the same channel and you are flipping between your sensors and theirs? Changing your ISS channel would eliminate this possibility. As this is your first post, welcome to the forum, rnbryan. I like Mark's suggestion as a place to start. I also use the Davis WeatherLinkIP™ Data Logger here. And although I am in a fairly remote mountainous area with very few neighbours, when I first installed the data logger I had to play with transmitter IDs in order to maintain a good connection. And then it worked fine for a couple of years. Then I had to experiment with moving my console to a different location on my home network. Eventually it liked whatever I did and has worked fine ever since. Let me also welcome you to the WeatherCat forum! There has been, however, an interesting anomaly in the temperature graphs. I'm graphing both interior and exterior temperature at the console as well as a remote temperature sensor in my greenhouse. After being in operation for 42 days, all three temperature graphs showed four square pulses superimposed on the curve. There were three pulses each lasting 2 hr and one pulse lasting a little over 1 hr, each pulse following the other with a 30 minute interval. It looked like a square wave was superimposed on the graphs. The amplitude of the pulse varied with the channel. After the last pulse, the graph reverts to normal. This episode has occurred three times since installation January 1, 2019. The pulse does not coincide with the temperature reported in the WeatherCat Controller. So this anomaly is a signal superimposed on the data channel at the graph. If Mark's suggestion doesn't solve your problem, could you please take a screen-shot of the graph and post it for us to take a look at it? There are details in the graph that might allow us to zero-in on possible causes which cannot be imagined simply from your description. There is another Vantage Pro station about 400 meters away, but I doubt the RF signal is strong enough to interfere. There certainly could be interference on the WIFI network as there are a number of devices connected. I extend the network via a combination of Apple Airport Express and Tenda P200 PowerLine Mini Adapters. The ethernet physical layer coexists with the house 120VAC wiring. I've attached a screen shot of a graph with the anomaly. Well it does not look like another station on the same channel as that would not affect the internal readings, and the fact that it jumps to a constant value. I can't think what could be the cause at the moment.... Over to the WC'ers! I've attached a screen shot of a graph with the anomaly. The exterior cooling potential is computed from the external temperature so when there isn't any temperature the graph produces that strange square pattern. As you can see, while the data is now valid, there were sensor errors for external temperature and wind. During the time when the sensors weren't available, the graph looks like the one above. If you ever seen this sort of bizarre graph again, definitely check the Live Data to see if there are sensor errors. Do keep us posted if you uncover anything. I think live data shows the data produced in that moment. How can I correlate live data with an event in the past? I think Edouard's posted Live Data does a good job to help you: the 'Status' is live, the 'Sensor Errors' are the encounted errors of the channel since last starting WeatherCat (the period that WeatherCat is running from it's last enabling till now). Reinhard has explained how WeatherCat operates under these conditions. WeatherCat accumulates all the sensor errors since it was last launched. If you had not restarted WeatherCat since this graph anomaly, you could simply check the Live Data window to see if there are any sensor errors. Of course, most likely you have restarted WeatherCat since this event. So this advice will have to wait for if this sort of strange situation occurs again. Should you see this graph anomaly in the future, definitely check the Live Data to see if sensor errors had occurred. By all means do let us know if you see this anomaly once more, and if so, whether or not you also observe sensor errors. We would be most interested in learning what you uncover. I saw this anomaly again today. There were no sensor errors. See the attached graph. Certainly a very strange phenomena and my hypothesis is definitely ruled out. The tilde ~ is the UNIX abbreviation for your home folder. It is best to make a copy of this file and then look inside. You can use TextEdit or better still a dedicated editor like BBEdit. There are comments at the top of the file that provide the connection between the keys and the data WeatherCat collects. It shouldn't take very long to see if these spikes in the graphs are actually getting recorded in the WeatherCat data files. Please do keep us informed of what you might discover. Following your instructions, edouard, I find that these varying points on the graph are from the WeatherCatData. For example, at 9:30AM on March 30, the external temperature is 0.11dC. At 9:52 AM, T is 4.67 dC. At 10:19 AM, T is 0.11 dC. Thanks for your help with this problem. Since you are seeing these values in the data, it is obviously not a graph rendering issue at all. I've never heard of any other WeatherCat installation having a problem like this and Davis stations are the most popular for WeatherCat. In addition, the Davis station downloading protocol is very old and well-established. This is well-proven code. What you are observing is very out of the ordinary and that suggests to me that your console may be experiencing some sort of issues. The best confirmation would be to observe the console during such an anomaly and see if it displays the temperature reported on the WeatherCat graph. It now supports a live-chat feature that might be suitable. Alternatively, there is a technical support phone number at the top of the page. If you can spare the time of waiting in line, I've found talking with a technical support person to be the most constructive. Do let us know what you uncover. The graph you showed originally seemed to have a constant value. Your last one shows differing values. It might be time to give Mr. Crossley's idea of changing ISS channels. That's not a difficult action and is one of the simplest tests.